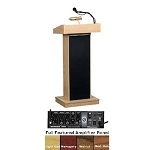 Oklahoma Sound Podium Orator Lectern Presentation Adjustable 800 Stand with wired and wireless microphone. Free shipping for this presentation podium when shipping to the lower 48 United States. Versatility is the key with these height adjustable lecterns. Suited to every speaker and environment, the spacious reading surface adjusts in height from 42" to 52" and is illuminated by a brass lamp. Features convenient digital time piece. Four easy roll casters are concealed under an elegant cabinet featuring gold appointments. BUILT-IN AMPLIFIER - Amplifier accommodates 2 microphones and a line source plus optional wireless microphones. Four 6" speakers provide a rich, full sound. Amplifier runs on 117V AC or 12V DC with the optional rechargeable battery. Complete with 40 watt multimedia sound system with capability for CD, tape record, wireless options and AC/DC operation. 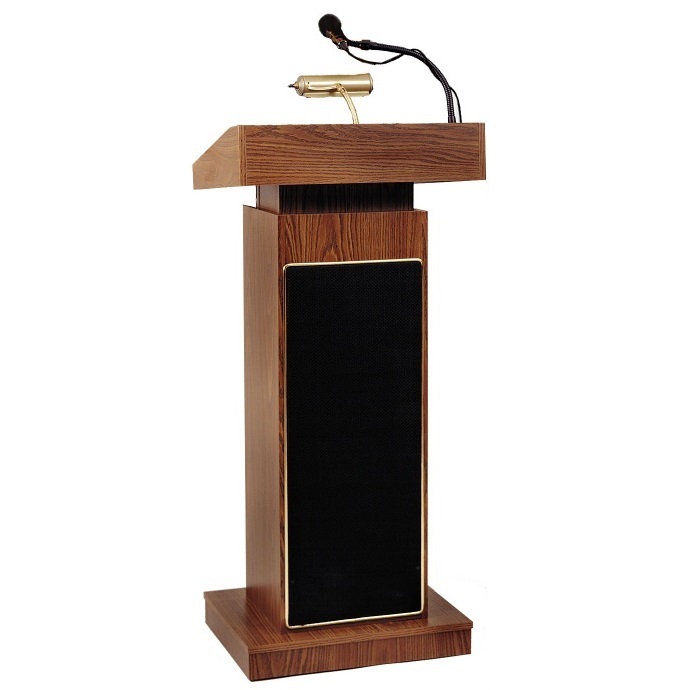 Competitive Edge Products, Inc. is an authorized distributor of the Oklahoma Sound Model 800 Lectern Orator Stand. Dimensions: 42" x 22" x 17"